Sam Heather, a vehicle glass technician at the St Austell branch of National Windscreens at Holmbush Industrial Estate, St Austell, Cornwall, is celebrating achieving his GQA QCF NVQ Level 2 in automotive glazing through the company-wide training and assessment scheme. 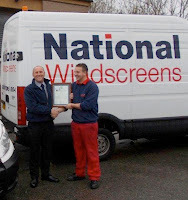 Sam, seen here receiving his GQA Qualification certificate from National Windscreens Regional Operations Manager Steve Perring, has been with the company three years and is among a group of engineers who are benefiting from the staff training scheme which covers the company’s 35 branches in the South and West regions. Sam, 23, is a talented sketch artist who lives in Bodmin with partner Amy and son Noah, and says his most unusual task recently was reglazing a crane 40ft above the ground. 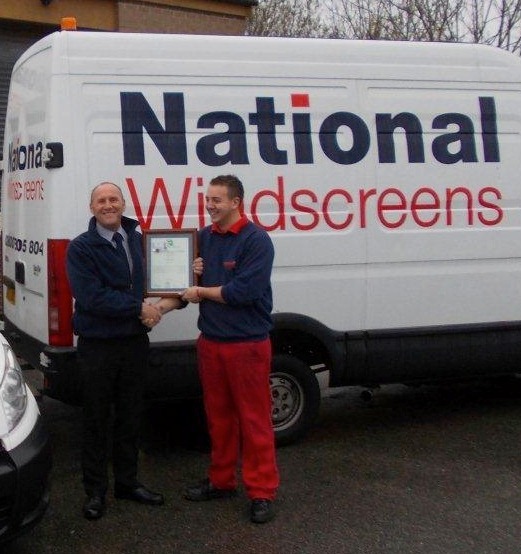 GQA’s QCF qualifications help staff further their careers and maintain the high quality assurance standards which award-winning National Windscreens offers its customers. GQA External Verifier/Technical Officer Sean Hayes said “It is always good to see qualifications used to develop and recognise individuals and I would like to add my congratulations to Sam".